Still crocheting up a storm around here. I'm using leftover Lion Brand Nature's Choice Organic Cotton yarn for Nova's ingenious ruby hexagon pattern. Long-time readers may recognize this yarn from my awesome, 70s style stripey blanket. I'll definitely need to pick up more, but it still feels good to use up all the bits and bobs. I'm also powering through the first sleeve for my Shalder cardigan. There are so many fantastic cardigan patterns out there right now, including Chickadee and Cria from Ysolda's new book -- I really want to finish this before I give in to temptation and cast on for another... Plus I need to start thinking about the Big Lebowski cardigan for Paul. My ice cream maker has been seeing some use! I made some terrific lemon curd ice cream last weekend -- I used this recipe, but simplified it by using a jar of Trader Joe's lemon curd instead of making my own. So tart and yummy -- especially good paired with blackberries. 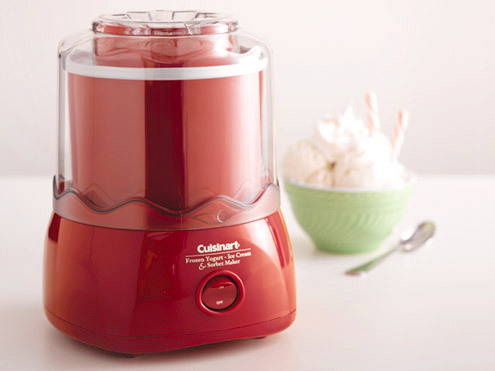 I loosely followed this recipe for cream cheese ice cream. It's good, but very solid -- the recipe could use a little tweaking. I'll post it once it has been perfected. The end of the quarter is in sight! I submitted grades this morning, and I celebrated by doing all sorts of lovely things today. 1. wearing my new limited edition Liberty print Bensimon tennies. Oooh la la, French tennies made with fancy British fabric! I heard about these from Kara at Knitting Lemonade and snatched them up when Piperlime had a big sale. Sadly, they're not available there anymore. I just may have picked up a second pair in another, equally cute Liberty pattern, too. 2. hitting the garden center and getting to work on my little balcony garden. It may not look like much yet, as I followed my mother's advice and pinched the blooms off the annuals (which is very hard to make oneself do although it's a good idea). I predict that it will be a peaceful green oasis again this summer. I even have a some herbs, tomatoes, and peppers back there. Now to find a good climbing plant for my Eiffel tower! 3. resurrecting the Shalom cardigan for my mom. Just one sleeve to finish, then the button hunt begins! I meant to finish this for Christmas. Oops... I never told her about it, so I think I'll just pack it away when it's done and save it until winter. I'm using some Cascade Eco+ that I bought on super closeout at WEBS a few years ago -- this shade of robin's egg blue is Mom's favorite. BTW, Eco+ is on sale at WEBS right now, too. Perhaps it's time to stock up... I'd like to make a Common Ground cardigan for myself. 4. seeing Death Cab for Cutie at Metro tonight! :-) I love you, Ben Gibbard. Here's hoping you all have a lovely weekend, too. Finally some sunshine around here! I may have bundled up in a wool coat and cozy handknit scarf to ward off the cold temperatures and 30-mph gusts today, but I was pleased as punch to see the sun again (and to leave my umbrella at home). 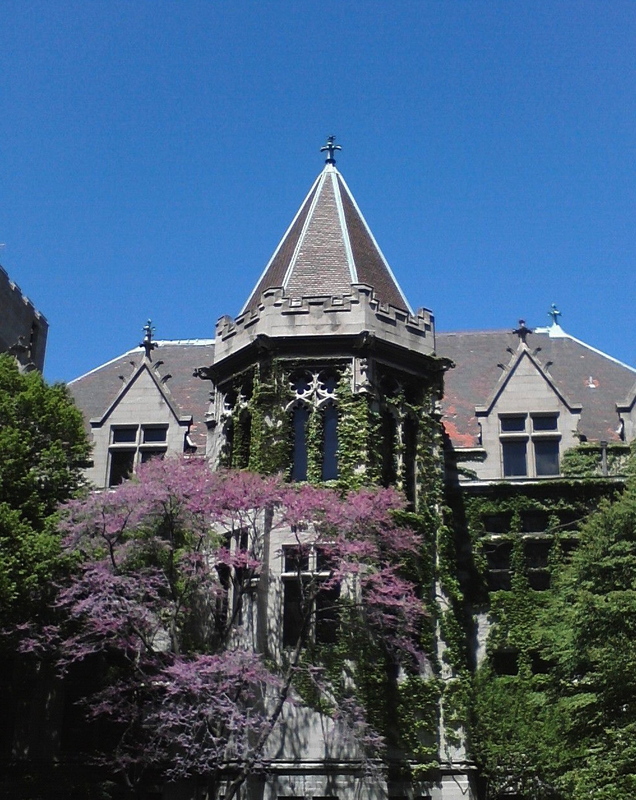 Despite the unseasonably cool and rainy weather, Chicago's flowering trees and spring bulbs have been making a valiant effort to cheer us up. All that rain did lead to a cozy weekend spent mostly at home, petting the cats and wielding the crochet hook. I absolutely loved this project, and I can't wait to give this as a gift! That said, I'd also like to snuggle up with it myself, but somehow a star-shaped afghan just doesn't seem dignified for a grown-up. So fun to make! This went super quickly. Like I said in my last post, the pattern leaves out a crucial step. In order for the star shaping to work, you need to skip working a 2 DC "cluster" at the inner angles of the star. Terrible name aside, the Cottontots yarn is very soft, cozy, and affordable. I started another one right away, using leftover yarn from my stash. I do need to pick up another ball of Lemon Berry (the darker yellow in the middle) to finish it up. It doesn't look lumpy in real life -- that's just the effect of spreading it out on the chesterfield. I'm finding crochet to be incredibly addictive. It goes more quickly than knitting, and it uses up oodles of yarn, so it's a great way to make a serious dent in my stash. This tea scarf just needs to be blocked! I used some hand-dyed cormo (picked up at the Wisconsin Sheep and Wool Festival a few years ago) and a J hook. The pattern's very easy -- I made a few mods that I'll post after I block it and take a proper photo. Capricha certainly is quite taken with it. Side note: cat owners, do not select Schumacher cut velvet upholstery, no matter how much you may fancy it. Cat. hair. magnet. 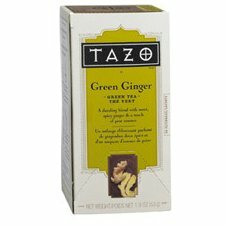 Speaking of things I'm hooked on, Tazo's Green Ginger tea makes absolutely fantastic iced tea, sweetened with just a few drops of honey. The ginger gives it a very nice spicy kick! Remember how I claimed I wouldn't start a new crochet project until AFTER the big brown (boring) border on the Noro giant granny square was done? Yeah, right... I *know* there's one more skein of brown yarn hiding in my stash somewhere, but I haven't plucked up my courage to dig through and find it. I'm mostly following this pattern (rav link), which is very cute and fun to make. Be forewarned, though, that the pattern leaves out a crucial step. In order for the star shaping to work, you need to skip working a 2 DC "cluster" at the inner angles of the star. I'm probably halfway done with this already -- it's going very quickly. The yarn is Bernat Cottontots, an affordable 100% cotton yarn that comes in cheerful colors. I knit a baby blanket with this yarn years ago... it turned out beautifully, held up well, and received lots of love. The yarn is a little tough on the wrists to knit, but it's much easier to crochet. Sadly I haven't been knitting or crocheting nearly as much as I would like, as I've been swamped. Reading, cooking, and TV watching have also gone down the tubes, so pretty much any form of relaxing has been abandoned. Somehow I did manage to squeeze in a baby sweater for (yet another) shower, though it took me over a month. I love the little owl cables, but I'm not a big fan of bottom-up sweaters. Attaching the sleeves was a pain, and I suspect that instructions for how to do the underarms are a bit wonky. You're supposed to leave the body's underarm stitches live to graft later, but there aren't any matching live stitches from the sleeves! I fiddled around a while until I just gave up, bound off the stitches, and seamed it up. The short rows to raise the back of the neck don't look great when you do the owl yoke in a contrasting color, just fyi. They do the trick, but it looks a bit odd.